Two elephant bulls have been relocated to Samara to join the cow-calf group translocated in October 2017. For the first time in 150 years, a functional elephant population calls the Plains of Camdeboo home. If you’ve been following our Facebook or Instagram pages recently, you’ll know that we’ve just had a rather exciting weekend. 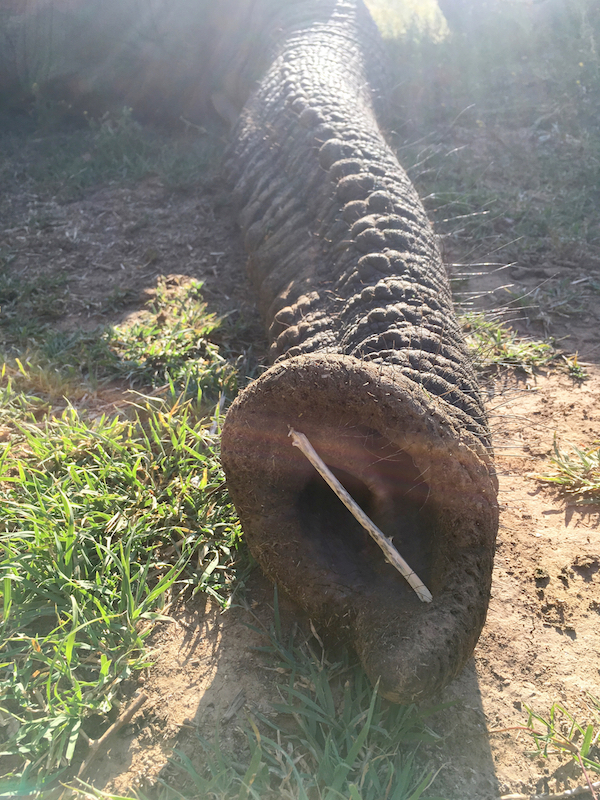 On Saturday 17th November we began the mammoth task of translocating two elephant bulls to Samara from Phinda Game Reserve in KwaZulu-Natal – 1,400 km away. Though months in the planning, the actual date and logistics of the translocation were confirmed only days before it took place, as is often the way with conservation manoeuvres of this nature. So it was a lucky coincidence that it happened to take place on the birthday of Samara’s founder Sarah Tompkins. But this was no ordinary birthday get-together. 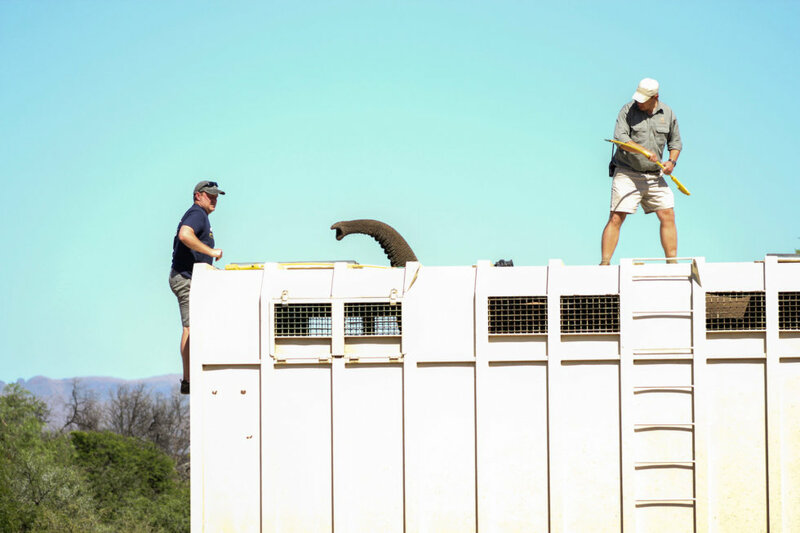 Everything had to be perfect – from the positioning of the specialist trucks custom-built by Kester Vickery of Conservation Solutions, to the availability of the expert translocation team from Elephants, Rhinos & People (ERP), to the weather both at Phinda and at Samara. Rain brings mud, and trucks get stuck in mud – especially when carrying 6-ton elephants – potentially endangering the lives of the pachyderms. 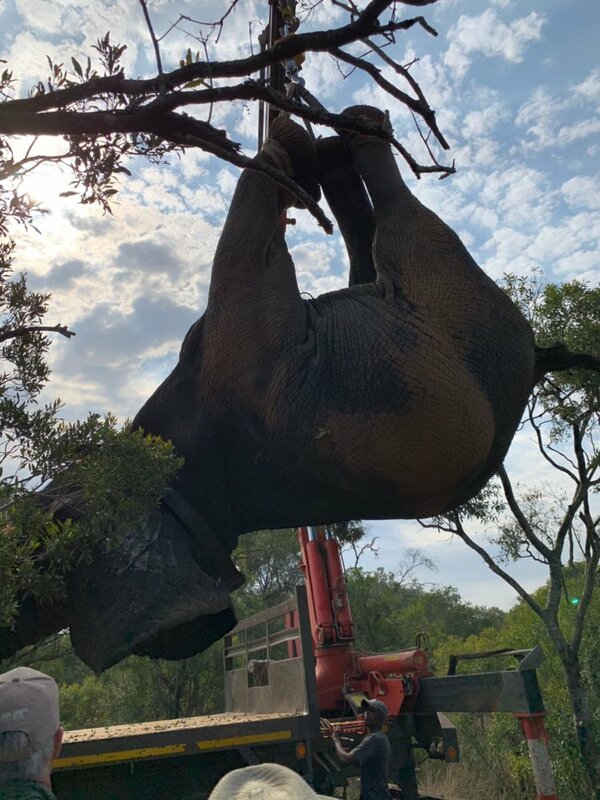 During these capture operations, the safety and wellbeing of the elephants is of utmost importance, and every precaution is taken to ensure a smooth translocation without incident. Read on as we uncover each step of the translocation process, from the bulls' capture early on Saturday morning to their release in their new home 24 hours later. The operation begins at sunrise on Saturday 17th November. By 5am all key players are assembled ready for the day ahead. Big game translocations start early to take advantage of the coolest hours of the day, when it is easier to keep the animals cool and to minimise stress. After discussing the plan of action, the helicopter takes off to locate the first elephant with the vet on board ready to dart him. The vehicles laden with the ground support crew speed off in the same direction to assist. 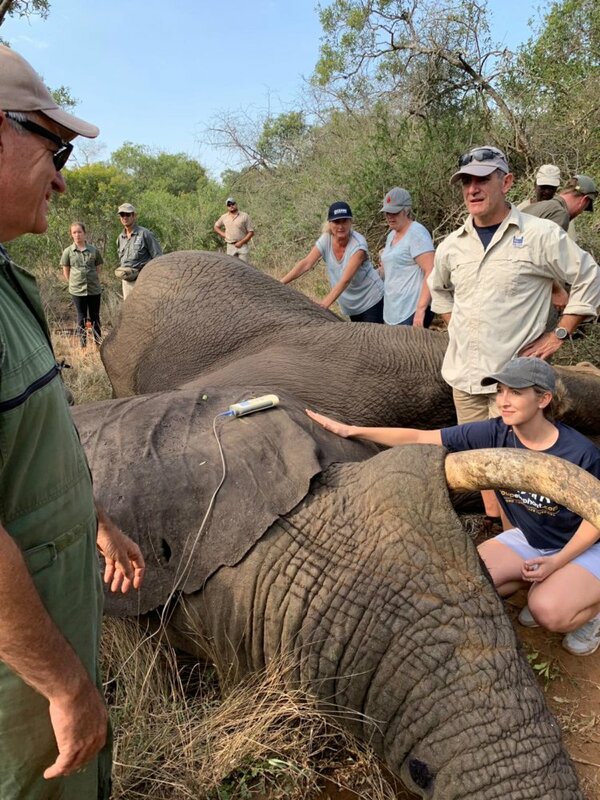 Once the elephant is darted, it usually takes around 4 minutes for the tranquilliser to take effect, so the team on the ground needs to be in the right place to see where the elephant falls once the drugs kick in. As it happens, the first bull to be darted, a 20-year-old male called Mvula, falls across a road making it easy for the ground crew to access him.  However he falls on his chest, compromising his ability to breathe, so the first priority is to pull him onto his side. Sturdy cables are tied around his feet, and everyone pitches in to heave him to one side. Once he is in a more comfortable position, the team springs into action. A twig is placed at the end of his trunk to keep his air passages open, with a monitor assigned to track his breathing. His large ear is flipped forward over his eye to protect it from the sun’s glare. 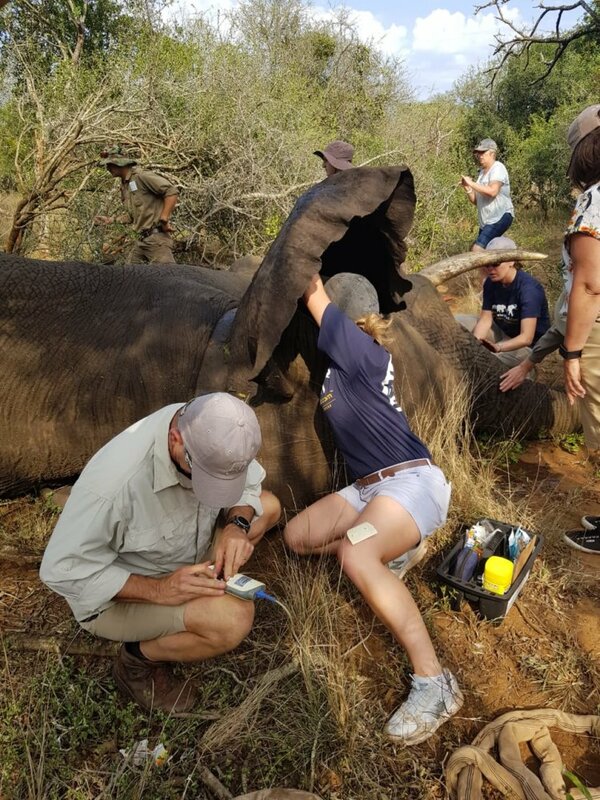 Measurements of his feet and tusks are taken to build his identification kit, whilst the vet team ensures his vital signs remain positive. Finally he’s lifted by his feet onto the flat bed truck to be driven to the wake-up crate which is a short distance away. It may look distressing, but this is the safest and most humane way of transporting elephants, not to mention the most effective for such a large creature when time is of the essence. The technique has been refined over the years and is used by all the foremost elephant translocation experts. The elephant is then lifted onto a truck with a thick rubber mat with cables running underneath. This acts as a ‘conveyor belt’ to winch the elephant into the recovery crate, where the vet administers the reversal drug. The doors are closed and the animal wakes up, still sedated, and gets to his feet. He then walks into the transport crate. It’s smiles all around as one elephant is successfully and safely captured. Now it’s time to look for the second bull. Once again the helicopter takes to the air, and eventually locates him in dense vegetation. The 30-year-old bull, named Kahle, takes longer to succumb to the tranquilliser – approximately 8 minutes. During this time, he covers a lot of ground, and eventually falls in thick bush. The vet team races to ensure his safety, whilst the ground crew clears some vegetation to allow access to the flat bed truck. As with Mvula, Kahle’s measurements are taken before he is lifted onto the flat bed truck by a purpose-built crane. The large elephant is weighed and comes in at a whopping 6.3 tons. Once stabilised on the truck, he too is driven to the recovery crate where he is woken up by the vet. He walks into the transport truck, the doors are closed, and it’s time to depart on the long journey to Samara. The truck leaves at about 9:30 am, and begins to wind its way towards the Eastern Cape, ably driven by Koos and Skukuza of Conservation Solutions. A team from Elephants, Rhinos & People (ERP) accompanies the precious cargo in a support vehicle, stopping periodically to check on how the elephants are doing. As Dereck Milburn of ERP remarks, the bulls are calm throughout the journey, spending much of the time asleep. 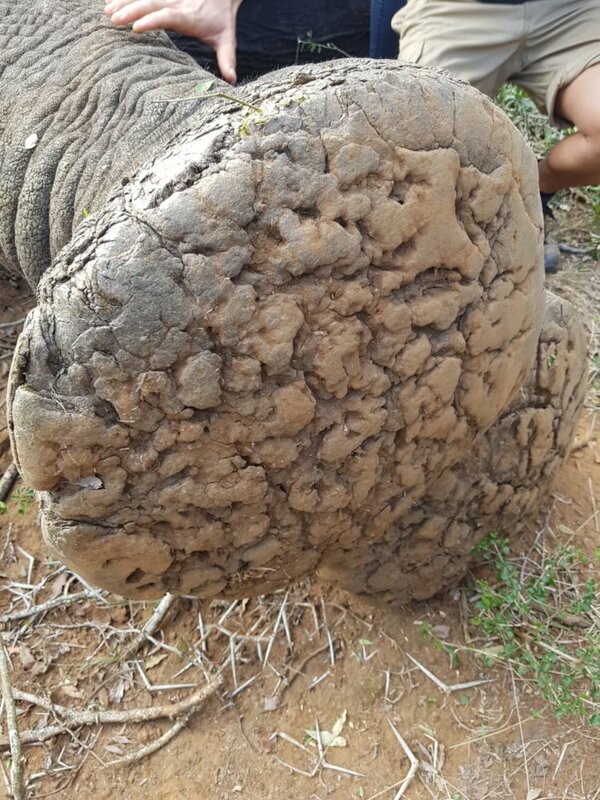 The older bull, Kahle, rests his trunk on a tusk or on the roof of the vehicle. 24 hours after departing KwaZulu-Natal, the trucks arrive at Samara Private Game Reserve, almost 1,400 km away from where they were darted. A team awaits the two bulls at Samara, eager to see them take their first steps into the reserve. This includes Samara guests who happen to be staying here during this exciting time, and who have been invited to attend the release as part of Samara’s commitment to showcasing conservation behind-the-scenes. The students and trainers of the SACT Tracker Academy are also in attendance. It will be difficult to mistake the tracks of these big bulls for anything else! The truck reverses up to the ramp built out of compacted earth. The doors to the truck are opened by members of the ERP and Samara teams to allow Kahle, who is in the first compartment, to exit first. He trumpets his arrival as he walks out, somewhat unsteady on his feet after the long journey. 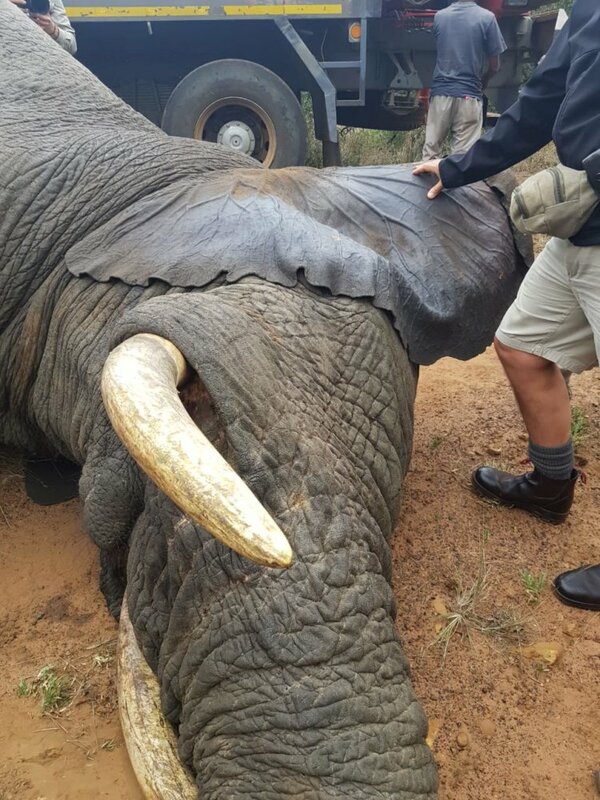 He is a huge animal, 3.1 m at the shoulder – the largest elephant bull that ERP has ever translocated. After taking in his spectators, he walks off into his new home. The younger bull Mvula had turned around in the truck during the journey, so when the time comes for him to exit he has to reverse out. He does so calmly and wanders off towards the river. As elephant bulls are social creatures, we expect that he will soon link up with either Kahle or the herd of females. A huge thanks must go to all those who made this a successful translocation. Elephants, Rhinos & People for overseeing and managing the logistics and for part-sponsorship, Kester Vickery and his team at Conservation Solutions for the mammoth translocation effort, Koos and Skukuza for their patience and skill in driving the truck, Phinda Private Game Reserve for the bulls themselves, the vet team and the innumerable hands who ensured the safety and comfort of the elephants. "We are delighted to be able to provide these elephants with a home and look forward to witnessing the new dynamic of having bulls on the reserve. As we continue to restore this breathtaking ecosystem, we are proud to make some contribution towards the conservation of this iconic species."